A lovely set of three (3) Marples carving sculpture chisels - with blue plastic handles. All different profiles one @ 25mm wide and two @ 16mm wide. Ideal for making rebates fitting hinges as well as general carpentry work. Bevel Edge Blade Pattern. Drop forged Steel Blades. Impact resistant plastic handles. 1/2" (12mm). 1/4" (6mm). Record Marples 2 Piece. Manufacturer : Record Marples. Steel Bevel Edge Wood Chisels. Size: 1/4 ", 3/8 " •Re d/ Yellow Handle s • Carpentry Woodworking Tool. Country of Manufacture : United Kingdom. M ateria l : Steel /Plastic. 2 Piece Steel Bevel Edge Wood Chisels. Size: 1/4 ", 1 1/4 " • Plastic Grip Handles • Carpentry Woodworking Tool. Handle: Plastic Grip. Country of Manufacture : United Kingdom. M ateria l : Steel / Plastic. 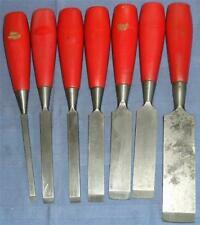 VINTAGE FOOTPRINT BEVELLED CHISELS RED PLASTIC HANDLE X7. Here is a matching set of seven footprint chisels. RED PLASTIC HANDLE X7. Blue Handle • Carpentry Woodworking Tool. 1" Steel Bevel Edge Wood Chisel. Handle: Blue. M ateria l : Steel / Plastic. YOU MAY HAVE REGARDING THIS ITEM. D elivery. Black Plastic Handle • Carpentry Woodworking Tool. Stanley 5005. Model: 5005. 1/2" Steel Bevel Edge Wood Chisel. Manufacturer : Stanley. If you are unhappy with your purchas e, p lease do not leave negative feedbac k.
Just own a chisel set, you can make your angle grinder into a power chisel. Power depends on your angle grinder. 1 Set x Wood Carving Chisel. Wood Carving Chisel Set only, other accessories demo in the picture is not included. A MARPLES CHISEL BEVEL EDGED WITH BLUEHANDLE. IN GOOD CONDITION THIS CHISEL IS READY TO GO. Made in Sheffield 13mm bevel edge chisel with a black plastic handle. Overall length 9" with a 4 3/4" blade from tip to handle. Carpenters black plastic handled 1/4" bevel edge chisel not sure of make. Each electric chisel is equipped with 5 special cutters and a small spanner. Wood Working Chisel Carving Cutter Wrench Flexible Shaft Set for Electric Drill. The electric chisel needs a supporting grinder or a small mill or a soft shaft with a soft shaft with a soft shaft that can be disassembled on a soft shaft and can not be used alone. Stanley no 5500 1/2" bevel edge wood chisel in good cobndition. Each electric chisel is equipped with 5 special cutters and a small spanner. Wood Working Chisel Carving Cutter Wrench Flexible Shaft Set for Electric Drill. Includes 1pc chisel, 1pc universal flexible shaft, 1pc wrench and 5pcs cutters. These tools are perfect for wood carvers. The handles are made with quality polished wood for comfortable grip and the chisels are made with razor sharp harden steel. One 1/4 " "U" gouge. One 1/2 " wood turning gouge. Each electric chisel is equipped with 5 special cutters and a small spanner. 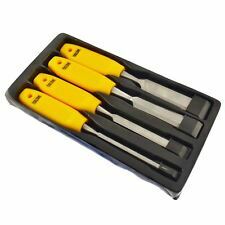 Includes 1pc chisel, 1pc universal flexible shaft, 1pc wrench and 5pcs cutters. Wood Working Chisel Carving Cutter Wrench Flexible Shaft Set for Electric Drill. Just own a chisel set, you can make your angle grinder into a power chisel. Adapter: M10. 1 x M10 Adapter. Power depends on your angle grinder. Fit for 100 Angle Grinder. Safety, effectively improve the efficiency of your work. Total Length x Chisel Length x Chisel Width x Handle Length. 1 piece Wood Chisel. - Plastic handle for comfort and impact resistance. - Material: High Speed Steel. People always bought together with. Wood Chisel Heat Treated Carbon Steel Carving Chisels Woodworking 25mm Was£4.93 x 1 Price:£3.72 x 1. Total Length x Chisel Length x Chisel Width x Handle Length. 2 Pieces Wood Chisel. Wood Carving Gouges Chisels Hand Woodworking Professional Tool DIY 1 1/2' Was£6.76 x 1 Price:£5.10 x 1. Total Length x Chisel Length x Chisel Width x Handle Length. 1 piece Wood Chisel. - Plastic handle for comfort and impact resistance. People always bought together with. Just own a chisel set, you can make your angle grinder into a power chisel. Adapter: M10. 1 x M10 Adapter. Power depends on your angle grinder. Fit for 100 Angle Grinder. 3X(Features. Safety, effectively improve the efficiency of your work. ). And the high-speed vibration is used for engraving. In addition to general wood, it is also possible to engrave ebony, soft plastic and so on. be used on a flexible shaft that can be removed. It cannot be used alone, and the motor speed should be less than 12,000 rpm.